I looked up the worlds, and I kid you not, I was able to find maybe ONE or two people beside me in all the active worlds. 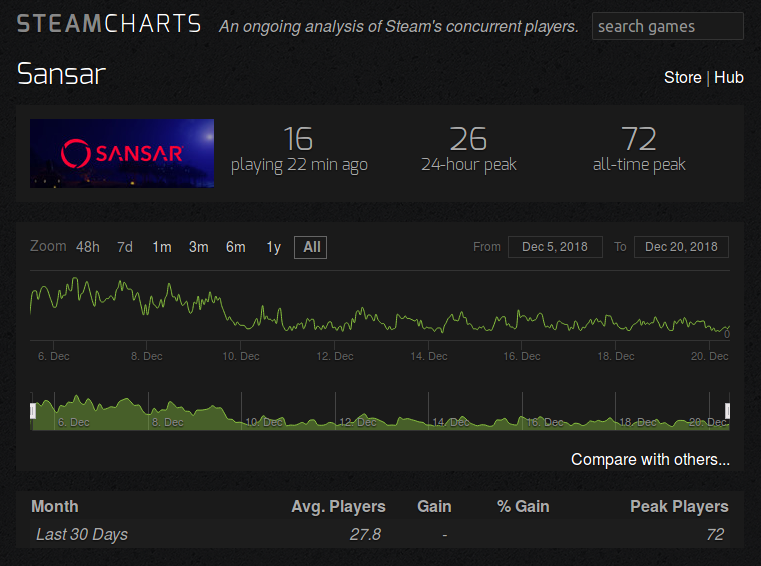 That is not a good sign, even if Sansar is still in its early debut. Now I assume both the Steam and standalone version share the same servers which reinforces the simple fact that there is hardly any interest in Sansar, especially because it roughly tries to mimicate an already existing virtual world called SECOND LIFE. I mean dear LL, what exactly is your game plan with this? If you wanna bring VR users to the mix, thats fine. But wouldnt it be easier to have it concentrate on ONE platform and rework the SL engine with the one you have in Sansar, make a second life 2.0 update? Im no economical marketer so im not gonna pretend I know any better than the finance people at Linden Labs but as a SL citizen, i just cant help but shake my head, because it feels like so much cash wasted into a pet project that evidently is nowhere near as popular as they probably hoped it would be. Right now, Sansar feels like its going nowhere and I rather have them invest time and money into SL. I think I can say it without much doubt in my head that most of us never wanted LL to start making ANOTHER virtual world project when their main one is still in dire need of optimisation and fixing so that it could finally run better than a bowl of potato. The old and tiring metaphor of equating VR with 3D TV persists for a few, but VR/AR is not a fad...it's the evolution of the internet. I think you need to get onto some other forums where VR enthusiasts congregate to fully understand how appealing VR is to many. VR/AR is steadily growing now, though not as fast as was predicted by some. If you look at educational and medical applications you will see all the ways VR/AR is being used even now, and learn of future plans to include even more VR in these industries. We're not 30 years into the current iteration of VR headsets (headsets that are for home use -- easier to use than the old ones, and less expensive). The current iteration only began in 2015 or so. High-end VR headsets like the Vive and Oculus keep improving, as well as mid to low-end headsets for Playstation & other types that require mobile phones. I see VR/AR like a baby being born, coming in waves that manifest like labor pains and then die down -- the fact that they die down does not mean VR is failing, rather the coming back over and over again is evidence that something is trying to be born. We only had to wait for better PC power and price reductions to allow for home use & the steady momentum that follows. But to your other point, about LL neglecting SL, I'm not sure pouring more money into SL would bring in new people. It might make some of us already here have more fun, but we'd stay around anyway so why should they spend the money? I have one big exception to the idea that not much can be done to attract/keep new users though, and that is the avatar problem -- I imagine this turns away new users due to the excessive complexity of the process and the expense. I see LL as taking a chance on the evolving internet as they realize SL can only be updated so much. It might be too soon for VR/AR though is the problem. That's what scares me. Yes, Sansar has no users now, but someday... That's an excuse for pouring more money down the money drain and neglecting SL. VR is a niche product with this generation of hardware. It's the new 3D TV. Even the successful VR games, such as Beat Saber, have only a few thousand users. Maybe 5 years out, there might be better hardware. But we're 5 years into Oculus development, and it hasn't improved much. We're 30 years into VR headsets, and they're still a pain. This is the reality of Sansar usage. For a free product. Can't even give it away. It's time to pull the plug. whoever at the company had this brilliant idea, i hope that person is fired since long. Like, what was the thought process behind this even? "Oh we have this virtual life platform that has been going strong since 12 years now, I wonder what else we should work on next, perhaps updating the engine to something more stable/optimising things? Nah, screw that, lets make a completely new product that is essentially competing with our old one, Im sure folks will totally love it and that it will totally rake in millions of dollars!" Indeed, much could be done...but would it bring in new people is the question...as well as would it actually cause greater retention for those already here. If not, I can't see why they would do it.